Here are the apron blocks that I have made. They are paper-pieced and this is the first time I have done paper piecing. Tomorrow morning I will meet with the rest of the group and we will swap blocks. Each person was to make 12 blocks. We will swap 11. 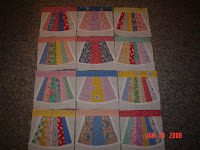 All our blocks were to be done with white backgrounds and "depression era" print fabric. This is the first time I have been involved in a block swap. It will be fun to see what others have done and put the quilt together. It will be a wall quilt. You've been a busy bee with all these projects!